Belhaven freshman Reid Nelson (Brandon, Miss.) led the Blazers with a 77-74-77=228 against mostly NCAA Division II competition at the Derrall Foreman Invitational hosted by Delta State in Cleveland, Miss. Nelson tied for 21st and sank 33 pars during the three-round tournament. 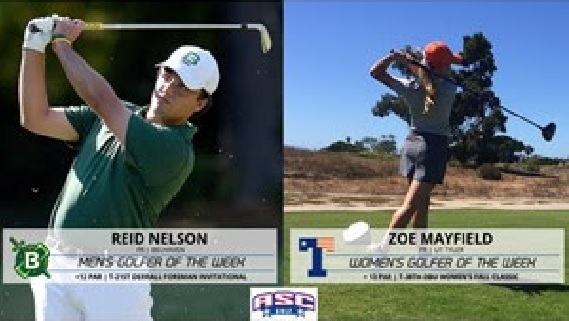 UT Tyler freshman Zoe Mayfield (Longview, Texas) earned her second Golfer of the Week honors of the season by tying for 38th against mostly NCAA Division II foes at the DBU Women’s Fall Classic in Dallas. She shot an 80-77=157 in the weather-shortened event. UC Santa Cruz freshman Claire Oetinger (Yosemite, Calif.) placed 18th with an 83-86=169 at the Culturame Classic in Canby, Ore.